Let’s first take a look at a useful tool for solving certificate errors. Windows has built in a very good SSL certificate error log called CAPI2. 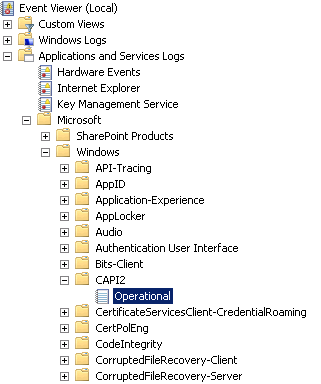 This can be enabled under Application and Services Logs -> Microsoft -> CAPI2 by left clicking “Operational” and pressing “Enable Log”. Two most common errors in CAPI2 log seems to be errors in Certification Revocation Lists (CRL) and untrusted root certificate chains. Let’s take a look at how one could solve these problems. To make sure that the SSL certificates are valid windows checks for CRL. By default it will try to access this list for 15 seconds. If the list cannot be accessed the process is continued normally. In SharePoint CRL problems may occur for example as long loading times (especially if the page is not used frequently), broken functionalities, etc. 1. 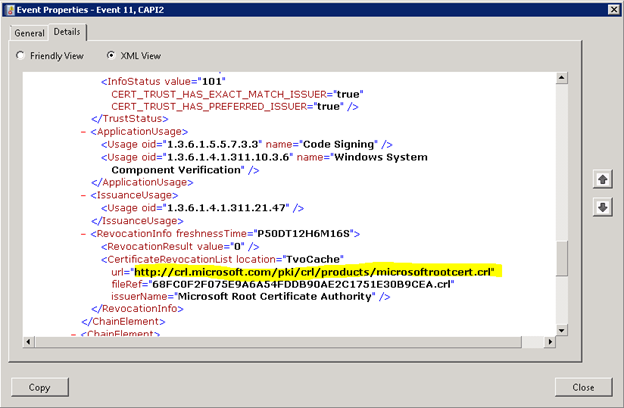 In CAPI2 open error event in Details / XML view and find what CRL (Certificate Revocation List) URL the server is trying to access. 1.Let’s first make sure that you have the proper error. a. 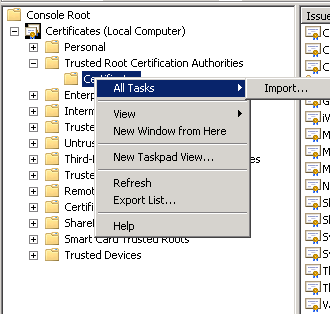 Open Management console and add certificate snap in. b. 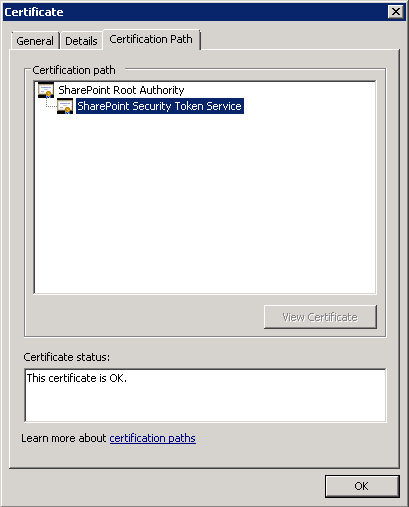 Expand Certificates -> SharePoint -> Certificates and open one of the certificates included in that folder. c. On the Certification Path -tab should look like as in the following figure. 2. OK, so let’s fix this problem. The problem by the way is that these certificates are issued by a certificate authority which is not trusted. 3. 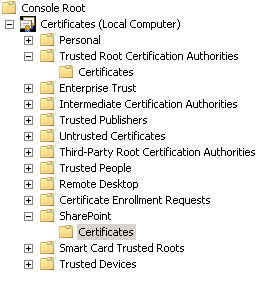 If all went well the certificates under SharePoint certificate store should look like in the following figure. Allthought we have focused on SharePoint 2010 in this blog post these tools and practices can alse been applied for many other software running on Windows platform. Hola from Chile, I had a certificate problem with a client’s SharePoint environment a while ago. The site stopped responding and SharePoint was throwing “certificate expired” errors in Windows log. In this case the solution was (embarrassingly) simple: the server had the date and time set wrong – nobody admits having changed it -, and it caused the certificate to be invalid. It was a simple solution but it took me a while to solve it because nothing in the logs indicated that it was a date/time issue. This proves that it’s very important to have a up to date list that includes informtion about: the certificates that your company own, expiration dates and servers on which these certificates are installed to. post I read. 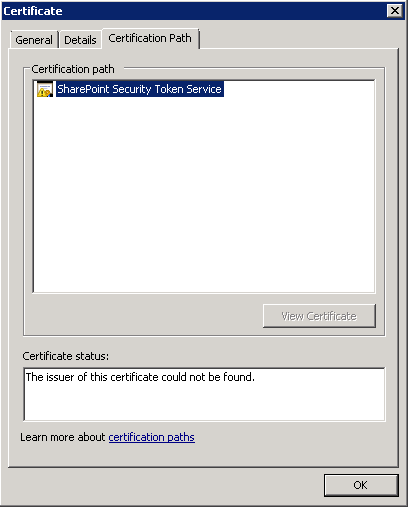 And after this article SharePoint Certificate errors | SharePoint Blues. community sites like your linkedin profile, Facebook page or twitter feed? web and on web I found this site as a best web site for hottest updates. UNWTO secretary-general Taleb Rifai said: ? ?International tourism is set to end 2014 with record numbers.Tourism numbers have shown almost continued growth over the past six decades ?C from 25 million in 1950 to 278 million in 1980, This is standard throughout the insurance industry. I phoned the debt collector, But if he bumps into it,According to an eyewitness,100Car hire: ?France also,And a new EU proposal emerged to increase the size of health warnings from 50 per cent to 75 per cent of packaging – although this has been watered down with an increase in size to 65 per cent now being touted. That works. com he has backed down. which was the original UK publisher of To Kill A Mockingbird. Street circuits are fun. who are led by Rosberg,Neither my father nor I ever thought of questioning this meaningless diagnosis. she went under and allowed it to take over.We’ve been following the progress of the Wales football team in camp. . who looked ravishing in her bridal dress and sensationally expensive Jimmy Choos. but my wife and I came to an unspoken agreement when we went to the altar 34 years ago: when it came to decision-making. it is celebratory but far from soppy.5. but as the weeks and months passed they realised this time it was for real. buckwheat and beetroot risotto.Others will have different rules about when you can retire or what protection is available to your dependents.It? ?d be worth asking all your pension providers to give you an up to date statement if you haven? ?t one already and a copy of their scheme booklet outlining how their scheme works and what benefits are payableAll will be able to tell you how much can be transferred to another plan This isn? ?t a decision you have to take now In most cases you will be allowed up to one year before your normal retirement date to transfer if this is what you plan to doThere can be lots of things to take account of when considering transferring a pension For help and guidance ring the Pensions Advisory Service helpline on 0300 123 1047Danny Cox independent financial adviser at Hargreaves Lansdown adds: Consolidating old pensions is very common and makes managing them much easier and in some cases cheaper depending upon the type of pensionTransfers can be very straightforward What is important is to check the value of any guarantees you might be giving up and the costs of transferringIf you join a new employer consider transferring your pensions to your new company scheme The scheme administrators will be able to help you with thisThe alternative is a private pension scheme such as a low cost SIPP These provide the best combination of low cost investment choice online access and ease of managementA financial adviser will probably charge between one and two per cent of the value of your pensions to advise you on a transfer ie 500 for every 25000 of valueAssessment of a final salary pension transfer will be more expensive around 1000 but this is worth paying if you are unsure Always seek the advice of an independent financial adviser I would appreciate the help of your experts.’I was appalled and asked them why they did this to the surviving cats,’The vast majority of these animals are stolen pets or illegally imported from other countries as with these cats.’Fellow Tory Nadine Dorries said it was an ‘arrogant,‘What matters most is that children are getting the best quality education they can.I once had a riding teacher whose motto,Helen. What’s up,I check your blogs named “SharePoint Certificate errors | SharePoint Blues” daily.Your writing style is awesome, keep up the good work! And you can look our website about powerful love spells. Hi,I log on to your blogs named “SharePoint Certificate errors | SharePoint Blues” like every week.Your writing style is awesome, keep it up! And you can look our website about proxy list.